When you’re searching for a video wall company in Maryland that is proficient in all things video wall solutions, choose a professional video wall installation company that is experienced with different industries. 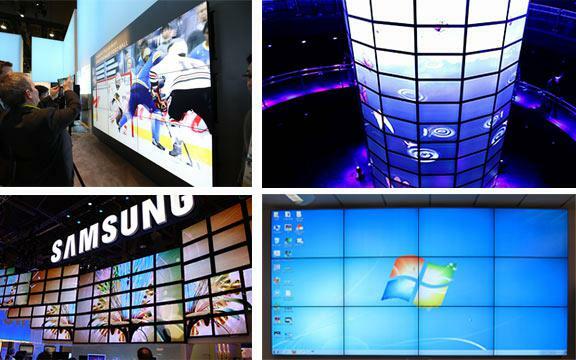 A video wall screen contains a multi-device setup, whether projectors, computer monitors or televisions to construct one large multiple TV wall. A HD video walls installer knows the proper screens to use that are designed specifically for video wall display systems. Capital Exhibits is a company that specializes in interactive video wall installation is knowledgeable in what display type will work best and located in Virginia and serving Maryland MD, DC and VA. Whether LG, Sony or Samsung, these screens must contain the hardware required to stack screens together in large display wall with multiple screens. Businesses use video walls instead of one large screen because they want the ability to customize their layouts over time. These LED video walls are used most often in places where displays need to be seen at long distance. They also work great for smaller places where individuals want to see a screen up close or at a distance. A wall screen can be used for countless different applications or businesses across Maryland. Capital Exhibits installs video wall solutions in schools, hospitals, restaurant digital menu boards, commercial buildings, restaurants, colleges, universities, government offices, shopping malls, hotels, airports, TV studios, convention halls, trade shows, hotels and any other Maryland business. Our TV wall solutions offer custom video wall systems in many sizes. We can handle developing and installing video walls whether LCD or 2×2 video walls, just to name a few options. In terms of portrait video wall services, we can install one large monitor or a group of them in a multiple screen video wall design of your choosing. Our video wall mount services secure your devices. We also can create TV wall solutions where walls may not be available such as hanging over walkways such as in a mall. Capital Exhibits offers a wide range of video arrangement designs to accommodate any business and their design needs. Make an imaginative video wall with the help of our professional video wall installation team. We can offer a clear picture in a design that works best for your vision. We offer both portrait and landscape display designs. Our arrangements also can be enhanced with high–performance speakers and other custom audio choices to match the needs of each Maryland business. These video walls can deliver your particular message easily. These edge-less screens allow you to change your content easily over time, any time that you want. No matter your industry or the message you want to display, any business in Maryland can benefit from our video wall solutions. Request a customized quote for your video wall system and get 10% off by mentioning the promo code, “VIDEO-ONE.” We can’t wait to hear you and to make your video wall dreams a reality!